The music is tight. The performance looks like a seasoned band on stage. And though the members in Haliwel have some years of experience between them, this Madison-based band is a new, exciting effort for all. Haliwel has been a dream of founder Shawn Streeter, since moving to the area a few years ago. But the guitar player and back-up vocalist, couldn’t find the right partners for his project. A chance encounter connected Streeter to Ryan Seney, another back-up vocalist and guitar player; later an ad led them to drummer Max Neal. This formed the core of the band, which created the sound in play today. Add inTravis Malin on guitar, and newest member lead singer Justin Schmitz, and this is five guys with a goal of ruling the music world. They aren’t wasting time—a C.D. of original music is already written, recorded, and available. The band just signed a sponsorship agreement with Dirtbag Clothing, a company created in the memory of Dimebag Darrell. And they’re putting together a show schedule for the summer, starting with a few here this spring. I recently had the chance to ask the three main members a few questions for Maximum Ink, including what it’s like to start from scratch in a new city, and how waiting for the right members is paying off. Maximum Ink: How long have you had an interest in music, and in particular, the heavier tunes similar to Haliwel’s original songs? Shawn Streeter: I began playing violin and alto sax in grade school, but from the start I didn’t enjoy learning other pieces, and would make up my own “songs!” In 8th grade I took an elective music appreciation class. Each student was given a 3/4 acoustic guitar to play for one semester. Instead of learning “Mary had a Little Lamb” and Smoke on the Water,” I was learning “Smells like Teen Spirit” and “Crazy Train.” My dad noticed and gave me an electric guitar and practice amp for my birthday. And my interest only grew when my friend got a guitar, and we started playing songs together. Ryan Seney: Believe it or not, I started by playing clarinet in the 6th grade! But the real reason for playing clarinet had nothing to do with music; more the childhood crush I had on my neighbor who offered to teach me how to play. I was pretty bad at clarinet! (Laughter) I started playing guitar in 8th grade and for the most part taught myself with various tabs and how-to videos. I was a huge Blink-182 fan, so you could say that was a major influence. I made the switch from guitar to bass about 5 years ago. It feels like a more natural instrument for me. Max Neal: I’ve been playing drums for 20 years, since 6th grade band. In high school, I started to play drum set in jazz band, and eventually formed a rock/grunge cover band with some friends. We played everything from a swim meet, to the Kohl Center, when our girl’s basketball team went to the state finals. Drums are part of who I am, and I have the marks on my steering wheel to prove it—I’m always tapping away! MI: So, similar backgrounds between you. Let’s fast-forward. How did your current project come together? SS: I never really had interest, even in college, I would just play guitar in my dorm room. At some point a friend and I started playing Seether covers at talent shows and open mics, then started writing our own songs. There are still some videos on YouTube of the early versions of “Original Sin” which we played at several talent shows—and won, by the way. So, I’ve been writing and playing original songs since, and formed what is now Haliwel. RS: Being a part of a successful band was a dream for me, early on. I wanted to learn how to play guitar but my real goal was to form or join a band, then play all over the world. You could say my plan is still in action, as we work together on Haliwel. MN: And I’ve always been in bands, from high school to college, then while working different jobs around the state. It is how I meet people, make friends, and enjoy being creative. MI: How did you end up meeting each other? Was it in Madison? SS: I moved to here to attend Madison Media Institute (MMI) to become an audio engineer. I met Ryan the first day at MMI and asked him to play bass, which he originally declined! (More laughter) I’d started searching for members to complete Haliwel on Craigslist, and while there, I found Max. RS: Growing up in North Dakota, I never lived out of state. But, after giving the university life a try, I decided I needed to stick to music and see how far I could take it. I found MMI, packed up, and left. I did actually decline to play in Shawn’s band at first. I was hesitant about switching to bass guitar, but decided I would give it a try. I’ve now been playing in Haliwel for five years! MN: I’m from Stoughton, and returned to Madison after spending six years in Upper Michigan for my first professional job out of college. I usually put up a flyer in a music store or go to Craigslist to find bandmates. But, I was at my wits end with Craigslist meet-ups when I moved home, and I was about to quit my search when I found Haliwel, and have been playing with them for three years. MI: The idea of Haliwel has been around, but you’ve only had this current group together for a couple of months. You’ve played out a few times, what do you think of the scene here? SS: Madison is a great area for musicians. There are musically gifted people around every corner. The scene isn’t as “rock” friendly as I would like, but we hope to change that! RS: I think the main reason the band wants to stick around Madison right now, is because of family and friends. Some of us are in relationships or have history here. I think there are opportunities here, even if it isn’t as rock focused as we would like. Hopefully we can change that. MN: Well, there are a lot of great opportunities in Madison, including studios, venues, promotion companies, and media. I think the infrastructure is here, and bands just need to find a way to take advantage of it, collaboratively. MI: Haliwel is also shaking it up a bit—you recorded your C.D., and are now playing shows. Are you happy with how it’s working out? SS: I have never been happy with myself as a musician. I want to continue to improve as a guitar player, and as a band. Each part I write is more difficult than the previous; I like to challenge myself as a guitar player and as a songwriter. As a band, I want to keep developing songs where each instrument is playing a strong part throughout the song. I am not a fan of three chord songs, and strive to write songs that vary, but structurally stay simple enough for someone to be able to tell which part of the song they are listening to the first time through. RS: My main focuses at the moment are accuracy, consistency, and energy. Nobody wants to watch a statue perform. I’ve always believed if something’s too easy, you’re hurting yourself more then failing at trying something difficult. I try to look at it in the same light when playing music. You have to push yourself. MI: And if you are planning on pushing yourselves, you must have some goals for Haliwel? MN: Yes, and definitely write and record more, but also to play shows, shows, shows. There are a lot of bands that tour through Madison, and I think we have the opportunity with our brand of hard rock to get the crowd in the mood before the headliner. We want to meet the members of other bands and form a group of like-minded musicians that just want to put on good shows, and have a good time. MI: The band is putting together a regular show schedule now, does it make you proud? It’s not easy to get this far, is it? SS: I am most proud of our self reliance. Our writing, recording, mixing, mastering, artwork, website, etc. has all been done by us. Literally, everything. RS: I agree. It’s our ability to do everything on our own, where most bands may have to pay others out of pocket to help out. We write all of our own music, have our own studio for recording, mix/master our own material, make our own website, and have created our artwork. It makes things much easier when you can keep it in house, so to speak. MI: What’s keeping you motivated? SS: The entire experience! Starting in a band, in Marquette, Michigan, where I’d stop a song halfway through, because some of the other musicians didn’t know their parts. Now we are starting to see actual fans singing along with the songs at our shows. It’s one of the best feelings I’ve had in my life—seeing people sing our songs. RS: It has to be one of the greatest things right now—people in the crowd singing your songs while you’re performing, and especially people you do not know. That’s something you always think about, but it’s a pretty crazy feeling when it’s actually happening! MI: And as you are out playing more shows, what’s something fun a new fan could talk to you about.. maybe something surprising about you guys or the band? SS: I have a surprising band fact. Before I found the current lineup, 6 drummers, 12 bass players, 4 guitar players, and 11 singers have been in and out of Haliwel. 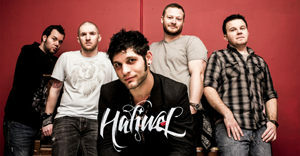 At this point, Justin (the lead singer) is the newest member of Haliwel and has quickly become a friend to all of us. Ryan, then Max, and eventually Travis (guitar player) are like family. I couldn’t imagine playing music without them. MN: Well, people say I don’t look like a drummer? I’m not sure what it means, but I still think playing drums fits my personality. It’s my opportunity to be creative, and have fun doing it. MI: And finally Shawn, you started this project with an idea of what you wanted it to sound like; and you seem pleased with what you’re hearing. How would you describe Haliwel to someone else? SS: I describe Haliwel as hard hitting modern music that perfectly blends aspects of metal and southern rock into the memorable melodies of the mainstream. Our sound is a little bit of a mix of Alter Bridge, Black Stone Cherry, and Theory of a Deadman. We hope it makes you want to come to a live Haliwel show. You will get everything described, but it will be presented by riff heavy guitars, booming drums, rumbling bass, and anthemic vocals. We’re pretty certain it will move you to throw your rock-fists in the air. Friday, March 28 at The Rox in Jefferson, Wisconsin. Friday, April 25 at The Annex/Red Zone in Madison, Wisconsin.